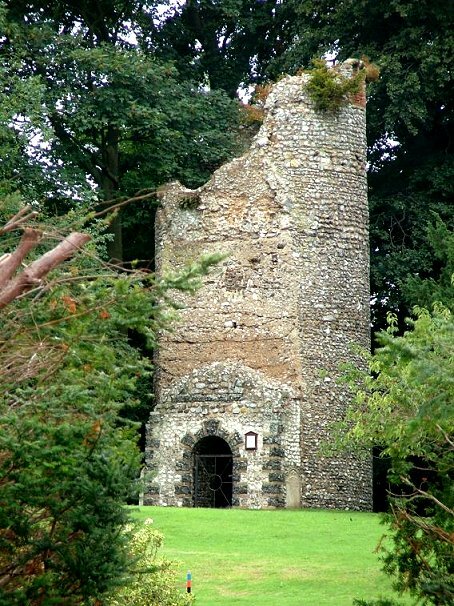 I have to be careful here, because this rather attractive ruined tower set on a velvet cushion of green is actually on private land, in someone's back garden. Indeed, it is in the back garden of the former Rectory, and as such in that of the largest house for miles around. Quite likely, the owner is a person of some consequence, and I would not want it thought that I had trespassed to get these photographs. In fact, you can see the ruin of St Peter through the gates - as long as the gates are open of course - but even so, I imagined how it would be if some trainspotterish individual turned up outside my semi-detached house near the middle of Ipswich, and began firing a camera up my back passage, so to speak. I probably wouldn't be terribly happy. 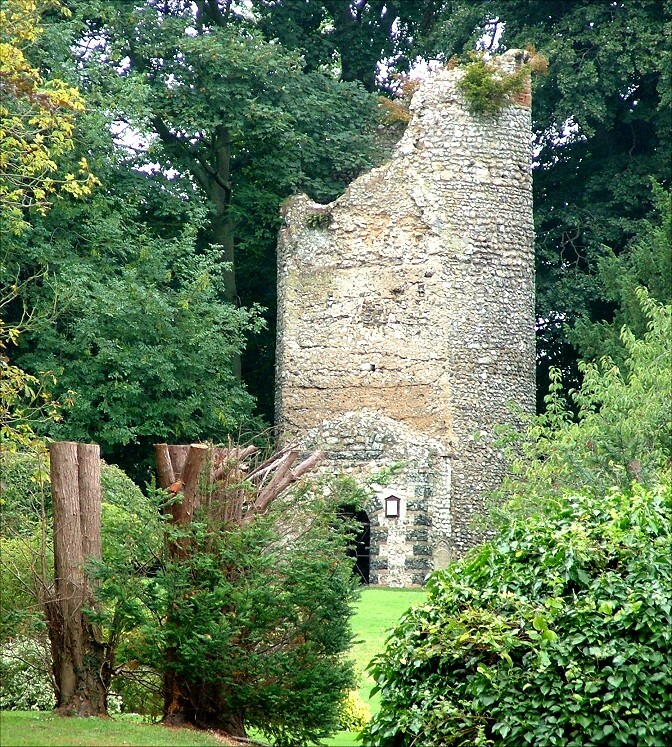 Mind you, if I had a ruin like St Peter in the back garden I hope I would be very proud of it. It would certainly give the neighbours something to talk about. I have a sneaking suspicion that the owners of St Peter are also probably proud of it, and would have been most welcoming if they had been in when I knocked on their door. The trouble is, of course, that I cannot assume this, and am loathe to send hoardes of Norfolk Churches site fans tramping up the drive. So, it might be best to make do with the view from the gates, until I hear otherwise. What you will see is the western face of a round tower, the remains of the west wall of the nave still visible against it. It must have been a tall one. The arrangement around the lower doorway is, I think, a later addition. The church was demolished in 1792, when the parishes of Little and Great Ringstead were amalgamated - this was the church of Little Ringstead. Today, the church of Great Ringstead is equally inaccessible.